The Beverly Fire Department responded to two separate incidents of fire in the woods on Friday, April 20. The first call came in at 1704 for the area of Sally Mulligan Park near Cross Ln. Engine 1 found a small area, approximately 15x20 sf involved in fire. Firefighter Tom Lantych and Captain Peter O�Connor used 2 water fire extinguishers to extinguish the fire. <?xml:namespace prefix = o ns = "urn:schemas-microsoft-com:office:office" />Approximately an hour later an Eisenhower Ave resident reported fires in the woods behind his home. Again Engine 1 and Deputy Chief Cotter responded to investigate the report. Deputy Cotter found an extensive area involved in fire. Firefighters stretched 400� of hose into the area to soak it down. Fire crews remained on scene for approximately one hour. While firefighters were in the woods, Manchester Fire covered part of the city. At approximately 11:50 PM Saturday, March 3, Firefighters were dispatched to a report of a motor vehicle fire in the area of 102 Hale St. When firefighters arrived, two vehicles were involved in the fire including a Jeep Grand Cherokee and a Nissan Altima. 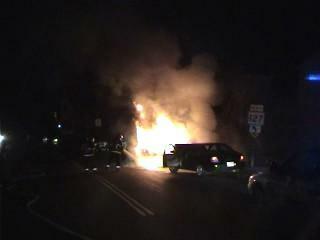 The Jeep was almost completely ablaze while the Nissan had a small amount of fire in the engine compartment area. Firefighters Mike Halloran and Scott Perkins with Captain Peter O'Connor worked to control the blaze that was complicated by burning gasoline as a result of a ruptured fuel tank. The fire was extinguished within 7 minutes of arrival using 700 gallons of water and 1 dry chemical fire extinguisher. There were no injuries reported to Fire Department personnel. The fire was caused when the Nissan struck the Jeep rupturing its fuel tank. The leaking gasoline came into contact with an ignition source causing the fire which spread to both vehicles. <?xml:namespace prefix = o ns = "urn:schemas-microsoft-com:office:office" /> The Beverly Fire Department swore in its two newest firefighters Thursday, March 1, 2007. 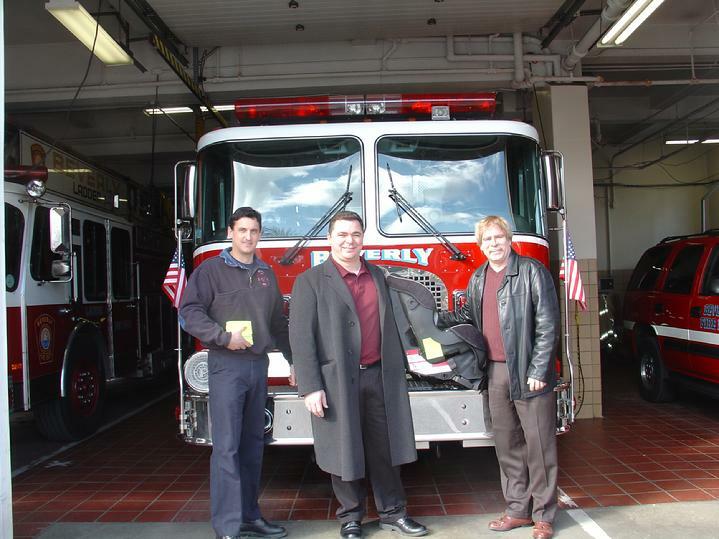 Firefighters Brian Mahan and Kevin Smith underwent a two week orientation with Department Training Officer Capt. Michael Acciavatti. The training included familiarization with the life saving equipment that they will depend on to do their jobs as well as basic First Responder training that focuses on responding to medical incidents. When their training is complete, each will be assigned to one of four groups to begin their normal work shifts. The two will attend recruit training at the Massachusetts Firefighting Academy at a date to be determined. 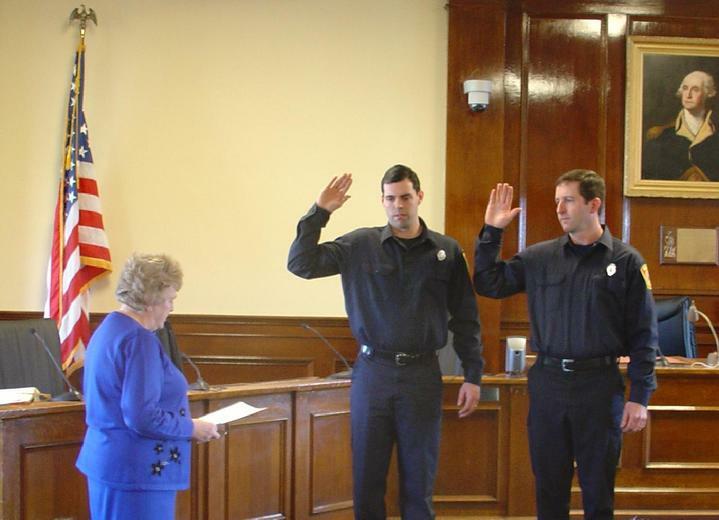 Firefighters Mahan and Smith are filling two vacancies created by the retirement of Firefighter Joe Malloy and Firefighter Todd Koen who transferred to the Cambridge Fire Department. The Beverly Fire Department Child Passenger Safety Division recently was the recipient of a valuable donation by the Kiwanis and Key Clubs. The clubs donated 1000 Emergency Notification stickers for application on inspected car seats. The stickers provide responders with valuable emergency information about the child in the car seat in the event of an emergency. The Stickers were presented to Captain Peter O'Connor by Dean Porteous and Shon Baldini.